LEA Only Dreaming pretty much stole the show when she wasn't in the ring. 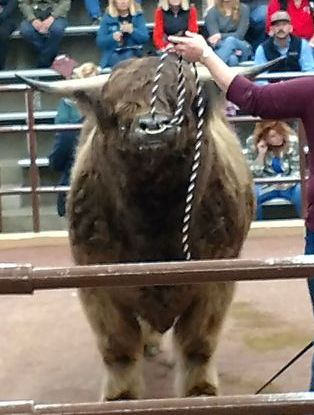 Steve Palosaari (Snowland Livestock) pretty much stole the show when he was in the ring. Had a great couple of weeks and now the Michigan shows have come and gone and we can get back to business. Had a great show at both the MASH in Novi, at the Michigan State Fair, and at St Joseph County at Centreville. Have to plug for the MASH though; cattle are housed and shown inside the Suburban Collection Showcase, fully air-conditioned and extremely comfortable. As opposed to Centreville in the middle of September, with some of our hottest weather saving up to wear on us and the cattle. Blistering heat and humidity made Centreville again a haven of cattle hosers, spending part of each afternoon cooling the animals down before putting them back in the barn. Saturday of Fair week finally saw the temperatures drop dramatically, to the point of requiring heavy coats. Welcome relief. We had a good turnout for both shows with some of the cattle pulling repeat performances. 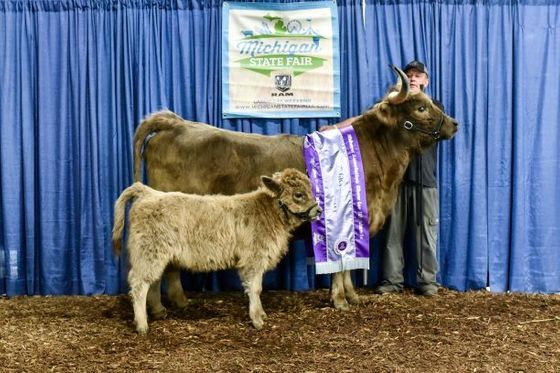 Notably: Snowland First Lady pulled a Michigan coup, defeating all comers at our three shows for rights to call herself THE Cow/Calf Champion. 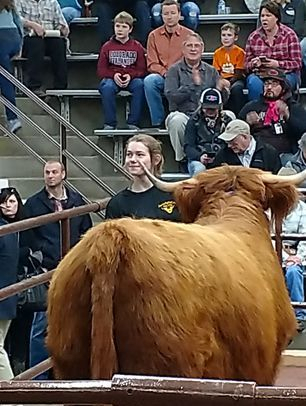 (She just completed the World Beef Expo in Wisconsin and finished as Reserve Grand Champion there.) She received numerous complements from all judges. 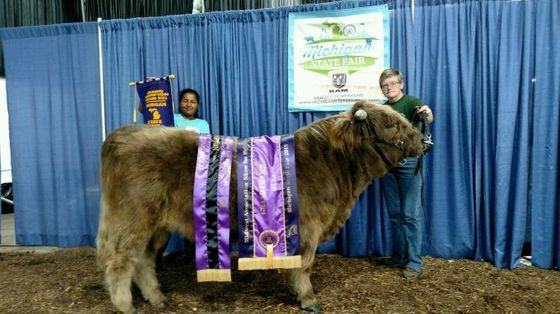 CBS Josie was awarded Grand Champion Heifer at both Centreville and Novi, while Dundonald’s Cho Sona was awarded Grand Champion Bull at Centreville and Gray Owl’s Scooter was handed the same title two weeks earlier at Novi. 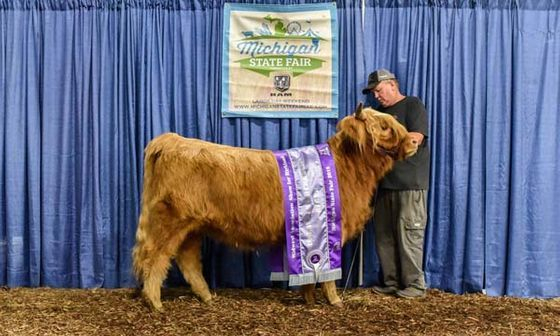 An excellent time was had by all at the UP State Fair Highland Cattle Show in mid August. We had 51 animals entered, qualifying us for Superpoint Statis for the ROE Show next year. Grand Champion Cow/Calf went to Snowland First Lady with Snowland Lady's Lily at side, bred and owned by Snowland Livestock. 15 year old LEA Yellow Jacket wowed the judge with her age and quality, winning Reserve Grand Champion Cow with LEA Oriana,her 13th calf, at side. She is owned by LEA-White Farms and bred by the late Ferris and Jean Leach. Annual AHCA Gathering and North Central Highland Production Sale a great success. 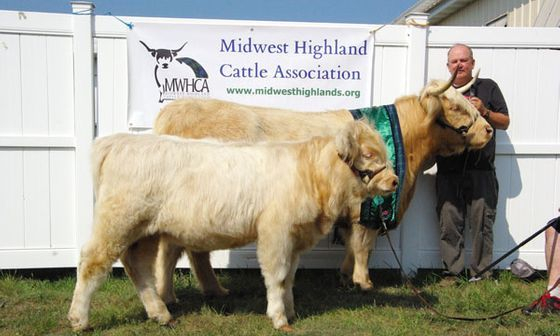 We had an excellent gathering in Lake Geneva Wisconsin for the AHCA Annual Gathering, which this year also included the 2nd Highland Production Sale organized by the NorthCentral Highland Cattle Association. There were some excellent opportunities for education, with special mention to Dr. Ron Gill of Texas A&M University, who gave a live demonstration of low-stress, common sense cattle handling. If you ever have an opportunity to participate in one of his demos, by all means take advantage: an opportunity not to be missed. Prices overall were excellent for the sale animals, with some high sellers represented by Midwest members. 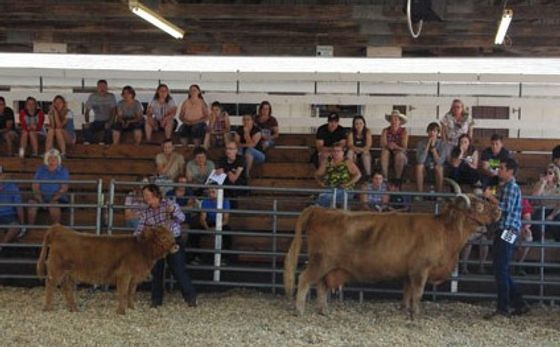 The highest selling lot was a cow/calf pair that sold for $8000.00. Windemere Farms had the high selling heifer Windemere Finesse, going for $6900.00 and the high selling bull Windemere Duke going for $5000.00. A special thanks to members Four T Acres and Cobblestone Farms for hosting. It was an incredible show and sale this year at Denver on January 19 and 20th, 2018. A fine representation of cattle again dazzled the Highland fans who sat back and watched the show. Once again, Finley Falls Duncan, a pairing of two LEA-White animals, bred by Ron and Phyllis Campbell of Missouri, owned by Bob Meyers of Virginia and shown by Heather Bailey of Wisconsin, took his 10th straight Grand Championship, to retire from the show ring at the pinnacle of his success, undefeated. 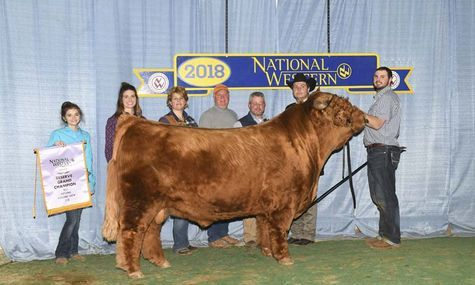 Reserve Grand Champion STR Special Edition, Shown by Symbiosis Ranch went on to become the 2nd high-selling bull at $7200.00 in the National Sale the next day. LEA-White Farms' LEA Hedy took Reserve Grand Champion Cow/calf. Other members with top placed animals included Cedar Ridge Farm's LSK HiLite, taking Reserve Senior Heifer Calf, Snowland Livestock's Snowland Teresa taking Reserve Intermediate Yearling Heifer, Symbiosis Ranch's Symbiosis Lady Graceland and Symbiosis Lady O'Tula taking Champion and Reserve Junior Yearling Heifer, LEA-White Farms' LEA Nightmoves taking Reserve Intermediate Bull Calf, and Almosta Farm's Almosta Farms Apollo taking Reserve Crossbred Prospect Steer. Dundonald Farm's Basswood 4 of Dundonald was awarded Get-of-Sire. The Junior Show was also a major success for Midwest Junior member Ellie Mitchell of Symbiosis Ranch Mt. Pleasant, MI. Ellie received Junior Grand Champion Breeding Heifer with Symbiosis Lady O'Tula, who also took Reserve Jr. Yearling Heifer in the Open Show the next day. This is Ellie's first year of showing and her first trip to the National Competition in Denver. 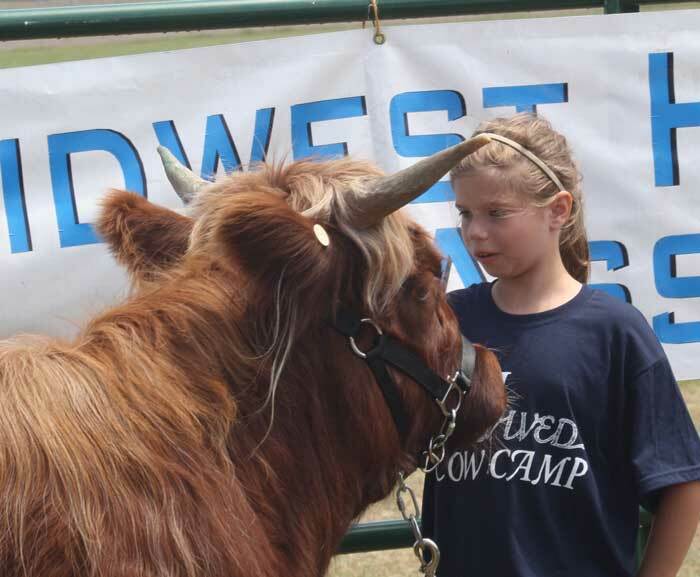 Ellie attended the summer cow camp here in Michigan and loved her experience. 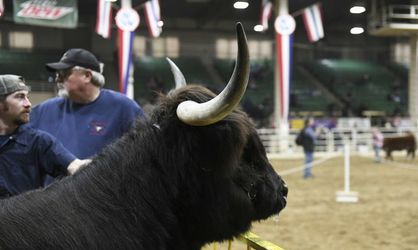 Complete open show results can be found here. Complete sales results can be found here. Complete Junior Show results can be found here. Ellie Mitchell congratulated by the Judge as her heifer is awarded Grand Champion Jr. Breeding Heifer. STR Special Edition takes Reserve Grand Champion Bull for Symbiosis Ranch. Reserve Grand Champion Cow LEA Hedy watches intently as her son shows in the Intermediate Bull Calf Class. 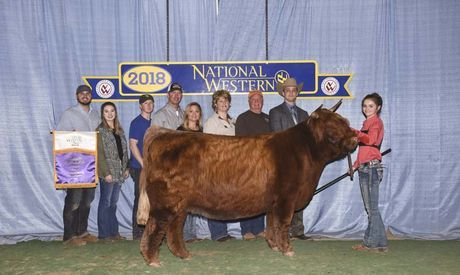 A legacy in the sales ring, as Dundonald's Amy Ruadh sells, standing behind her dam and sister, with a pedigree tracing back to one of the first cows Eddie MacKay ever showed at the NWSS. Symbiosis Lady Graceland takes Champion Jr. Yearling Heifer. Symbiosis Lady O'Tula wins Grand Champion Junior Breeding Heifer. 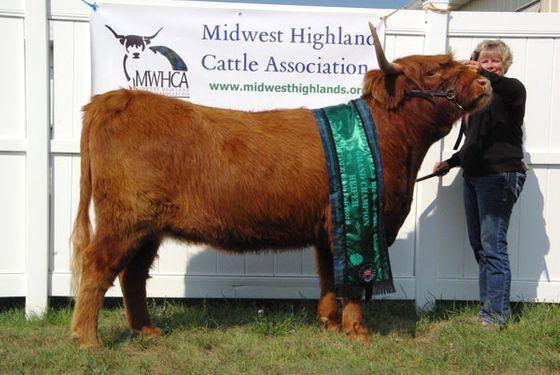 The Midwest Highland Cattle Association serves Illinois, Indiana, Michigan and Ohio as a regional affiliate of the American Highland Cattle Association. 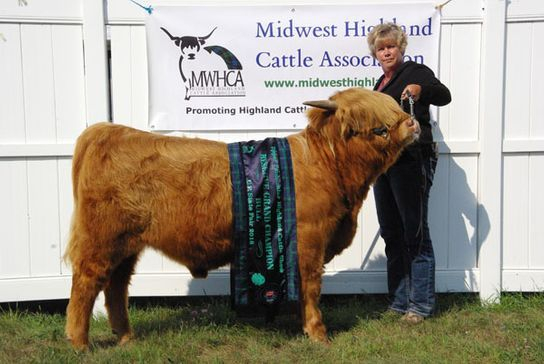 Hold events and activities centered around Highland Cattle. 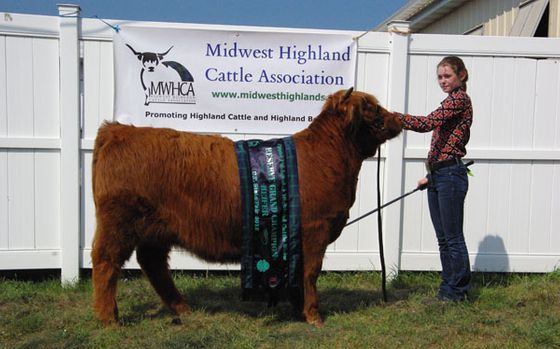 Provide valuable information for breeders and prospective owners of Highland Cattle. Promote and encourage improvement of the Highland Cattle breed. We look forward to sharing our interest in Highland Cattle with you! Highland Cattle draw a crowd wherever they are found. Highlands are an old breed whose time has come. With the ability to thrive in less than ideal circumstances, outstanding mothering instincts, longevity, and very low calf mortality, they are the type of beef animal that is in demand for today’s market. The first Highland herd book was published in Scotland in 1884. Although the Shorthorn, Hereford and Angus herd books were all published many years prior to that of the Highland breed, there is little doubt that Highlands are probably the oldest recognizable breed of cattle in the world. Importations to the USA and Canada began in the late 1800's. Today Highlands are found throughout North America, as well as in Europe, Australia and South America. Highlands require little in the way of shelter, feed supplements, or expensive grain to achieve and maintain good condition. Cold weather and snow have little effect on them. They are raised as far north as Alaska and the Scandinavian countries. They also adapt fairly well to more southerly climates with successful herds as far south as Texas and Georgia. Less than ideal pasture or range land is another reason to consider the Highland breed. These cattle are excellent browsers, able to clear a brush lot with speed and efficiency. Despite long horns and an unusual appearance, Highlands are even-tempered, bulls as well as cows. They can be halter trained easily. The business end of any beef animal is the amount and quality of the beef it produces. Today’s market demands lean, premium meat. The Highland carcass is ideally suited to meet this challenge. Highland beef is meat that is lean, well marbled and flavorful with little outside waste fat (they are insulated by long hair rather than a thick layer of fat). 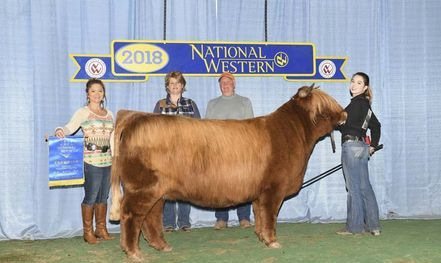 Highland and Highland crosses have graded in the top of their respective classes at the prestigious National Western Stock Show in Denver, Colorado. In the British Isles, Highland beef is recognized as the finest available and fetches premium prices. The British Royal family keeps a large herd of Highlands at Balmoral Castle, near Braemar, Scotland, and considers them their beef animal of choice. Today’s cattle market is demanding. Regardless of whether you are a small farm with only a few head or a large ranch with hundreds, your objective should be the same … to produce a fine cut of beef with as little effort and expense as possible. Highlands are the breed to help you do this. Whether your interest is in purebreds or cross breeding, we are confident that the Highland will improve your bottom line. 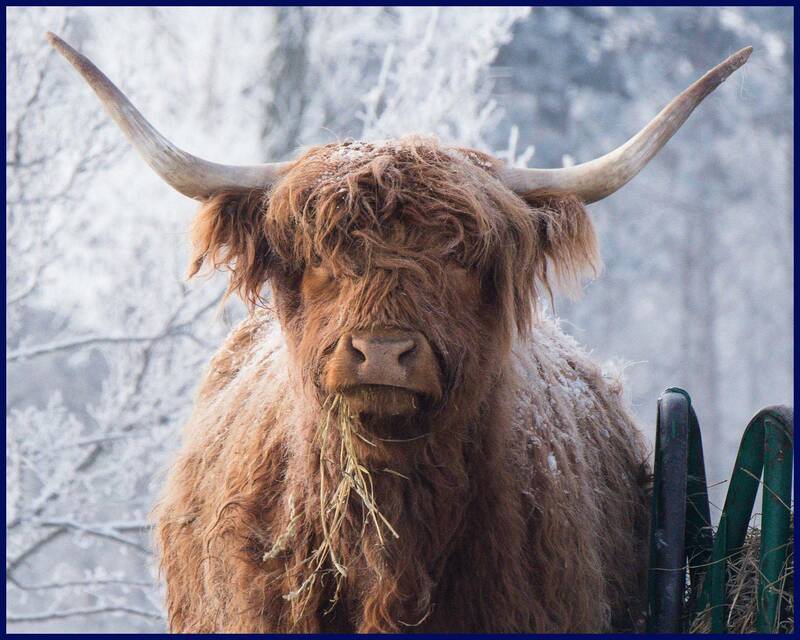 The Highland is a unique and beautiful animal … truly "the breed apart." PayPal now available for on-line payments. You can now pay for your membership dues by credit card. Click Here for all Membership including Gift membership at 1/2 price. You can now pay for classified ads by credit card. Click here for Classified Ads and Membership Renewal.